Rod Rack 10 rod 3 drawer fishing storage ,, felt line rod rack w utility storage area room for 6 utility boxes Oak veneer finish,,, picure is actual item in box unopened . Two bracket mounts on inside of cabinet for shelves. (The cabinet is wider than the mirrored door.). Zoom Supply American Specialties 8340 Recessed Baked Enamel Medicine Cabinet One-piece, drawn cold rolled steel with white powder coated steel finish. Stainless steel channel framed mirrored door with ¼" (6 mm) thick plate glass, has continuous piano hinge and magnetic catch. Three removable white enamel steel shelves. [Track Page Views With Auctiva's FREE Counter] (https://pages.ebay.com/seller-center/listing/listing-advanced-sellers/third-party-listing-tools.html#auctiva). Coordinates with Jacquard vanities for a matched ensemble. Color: Linen White. Mounts directly to wall for easy installation. OPEN BOX - NEW. Grab The Best Deal! 100% functional. Q: Is the Original Box Included?. The 16 in. Cabinet has a Stainless Steel case with beveled mirror. And only use recess mount for it. Stainless steel case with beveled mirror. Recess mount only. Adjustable glass shelves. WE HAVE A HUGE INVENTORY COMING IN FROM A CLOSED GOV. OFFICE / LAB AND GARAGE. Features one large soft-closed door with right-hand swing installation. Includes pre-installed wall hangers to aid installation. Features adjustable shelves inside the cabinet for ample storage. We search out the best deals and pass them on to you. 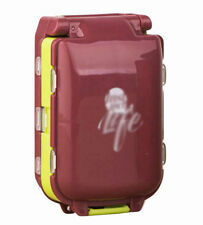 • We do not accept any responsibility or liability for misuse of this or any other products. 3 Tiers for ample storage space. 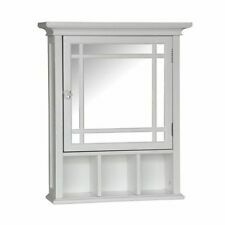 Use this cabinet/mirror combo in your bathroom or hallway. Its subtle design in white shines in every room. This large mirror makes sure that nothing is ever out of your sight. This is an unique, one of a kind mirrored cabinet that is handmade from solid Poplar. · Solid wood construction. This nautical solid aluminum shallow depth medicine cabinet Porthole Mirror has a round diameter of 21.5" and is 3.5" deep. The mirror is approx. 14 1/8" in diameter. The surface wall mount medicine cabinet swings open to reveal 3 interior shelves that are perfect for reducing bathroom clutter, they all measure approx. 2" depth (below are full dimensions for the shelves). 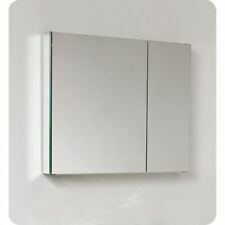 The porthole mirror medicine cabinet is made of solid aluminum and has a chrome nickel finish (finish and minor blemishes may be varied). There are two wall mounting holes located on the back of the porthole, wall mounting hardware is included. This porthole mirror medicine cabinet would make a great addition to your nautical wall decor. Size: 21.5" diameter, Mirror size: Approx. 14 1/8" diameter. Condition is Pre-owned. Can be surface mounted OR recessed. One glass shelf with room to replace more shelving inside. Recessed part of the cabinet is 11.25” x 15.5”. This has the greatest little cubby holes & shelves. Look at the brass latch that locks the door shut.rare & beautiful. Gorgeous crystal glass door knob with iron bolt. I installed new glass in the door. ECT Global 4030 Above Counter Round Basin Ceramic Vanity White. These round Vessel Basins are designed to be sit on top of your cabinet. Creating a compact classic bowl look. Great for a modern look in any bathroom for both the DIY and professional alike. Very attractive woodena pothecary wall cabinet with a beautiful old character. 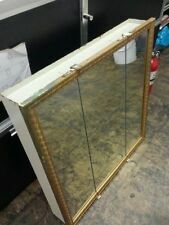 Mirror is very old and used, one small crack on the side. Has green chipped/worn paint for a shabby chic look. Nice Solid Construction out of pine I believe. Has a neat latch (see pic 9). - I will describe to the best of my ability each item with honesty. When you need storage space for your vitamins and medications, consider placing a medicine cabinet in your bathroom. This bathroom storage option provides a safe place to keep your medicines organized and out of the way of children and pets. Many models are designed to resist humidity and rust, making them durable enough for long-term use. How do you mount a medicine cabinet? Recessed mount: A recessed mount will fit into the cavity of the wall, using up less space. A recessed storage design may be more visually appealing, as it blends with the room more easily. Surface mount: Ideal for those unable or unwilling to dig into their walls, a surface mount unit simply attaches to a stud. This method of installation in your bathroom is extremely simple to do, and the furniture is easier to access if you're unable to reach very far. What accessories and options can be installed with a medicine cabinet? Vanity: lights Adding a vanity light to your surface mount or recessed medicine cabinet can create a warmer environment in the bathroom. The light also helps you see which bottle you are picking out or to give more natural light when applying makeup. Shelves: Additional bathroom storage shelves will help you to optimize space, allowing you to store more items. You can use different shelves to isolate one person's medication from another. Mirrors: You can hide the bottles and make the storage cabinet more aesthetically appealing by placing a mirror over the unit. Options include mirrors which slide to the side in order to open the cabinet as well as mirrors you can push in and open out. Frames: You may want to consider choosing a cabinet with a frame that blends with your room's architecture. If you are using a recessed mirror, you may decide to go without frames for a sleek look in your bathroom. Safety locks: If you have small children in the house or extremely strong medications, you may want to consider installing a bathroom cabinet with a lock for extra security. How much weight can a bathroom medicine cabinet hold? Recessed cabinets will generally be able to hold more weight than surface mount due to the extra support of the wall frame. The actual weight will vary by the cabinet. Most items will state their maximum weights, so check that information in the product's specifications to find the option right for you. What brands manufacture bathroom medicine cabinets? Common name brands for medicine storage cabinets include Kohler, Vigo, Robern, and Elegant Home Fashions. If you don't care about the brand name, there are generic versions available as well.